The LEGO Movie 2 The Second Part is scheduled to be released in the United States on February 8th, 2019. Abbreviated TLM2, the new computer-animated film is the fourth release in the franchise. It is the sequel to the first LEGO Movie and will build upon the surprising ending. Additional spin-offs from the original movie include LEGO Ninjago and Batman Movies, both released in 2017. 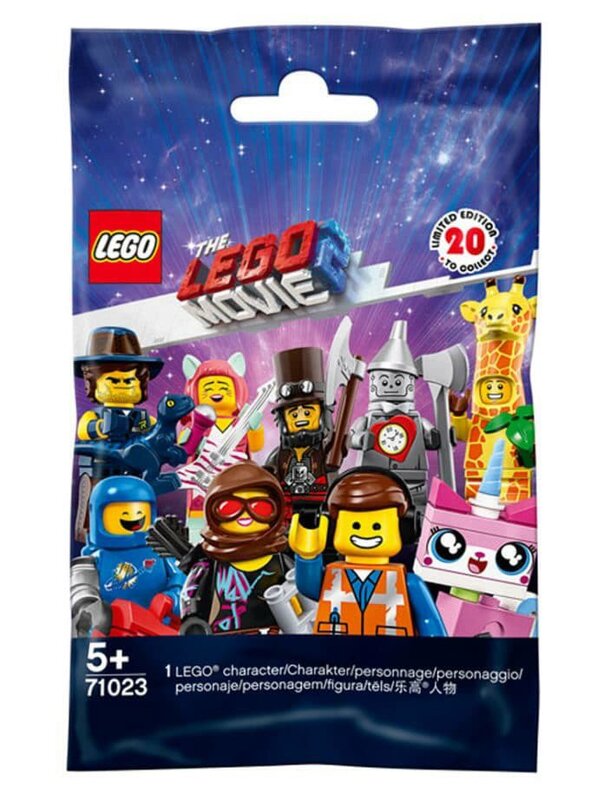 As most will know, all previous movies received their very own CMF series and The LEGO Movie 2 will follow suit. 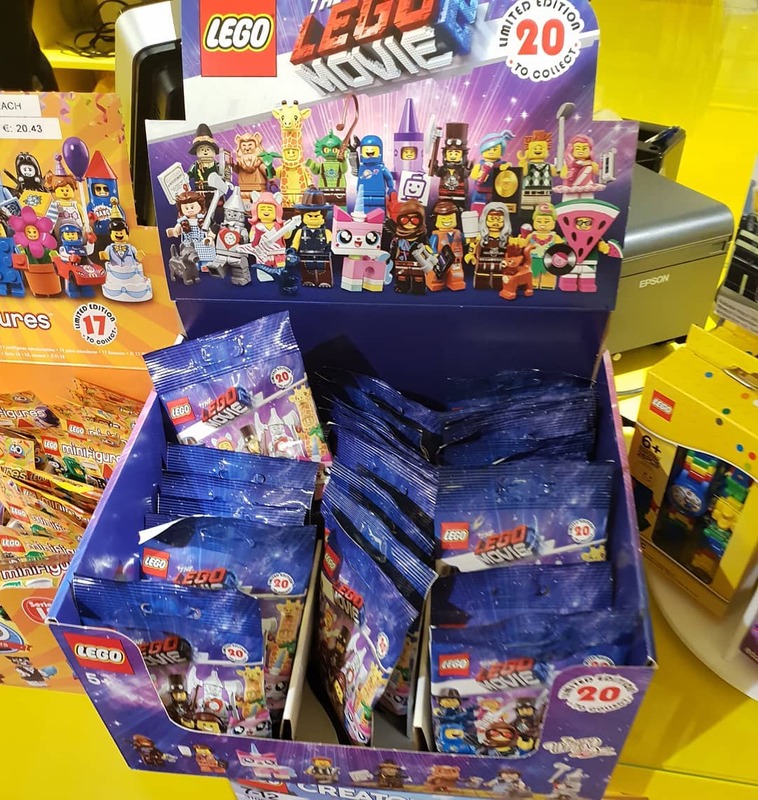 In this updated guide, you will find all of the latest news and our review for The LEGO Movie 2 Minifigures Series. 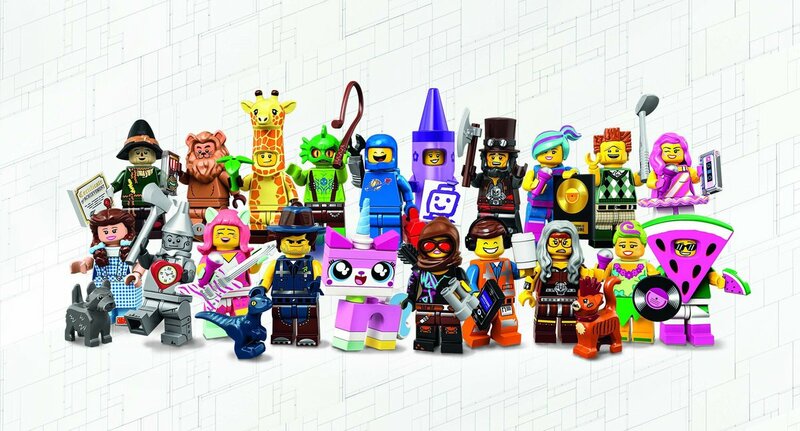 Find high quality images, along with our thoughts and opinions, for all the new minifigures of the LEGO Movie 2 Collectable Minifigures Series below! As shown by the random sealed bag above, the set number is 71023. See below for our full review of each character featuring in the new CMF. Thanks to Jay’s Brick Blog for an excellent job at naming the characters (currently not been officially confirmed) and to Promo Bricks for sharing the images via their website. 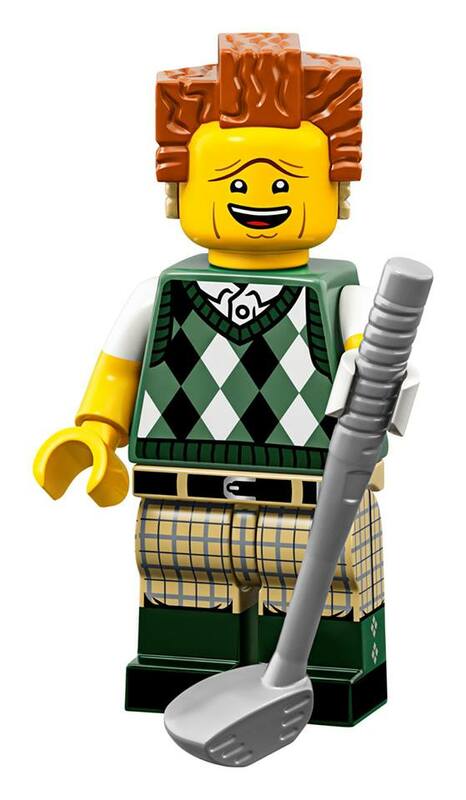 First up we have Emmet, as he appeared in the first The LEGO Movie 2 teaser. 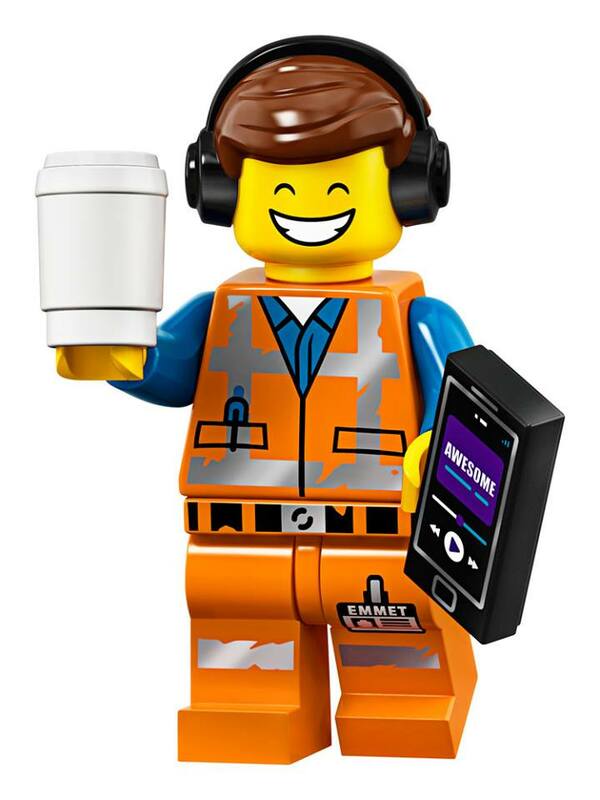 He has a new hairpiece with dual-molded headphones, a big printed smile, and his orange construction outfit. His accessories are a takeaway coffee cup and a printed 1×2 tile for an MP3 player. Next is Warrior Lucy. Her torso, legs, and quiver pieces are also available in the regular sets, but she appears to have a new head print and a new head accessory. It is a brown hood with red goggles molded in, and appears to continue into a neckwrap piece. Her only accessory is a binoculars piece. 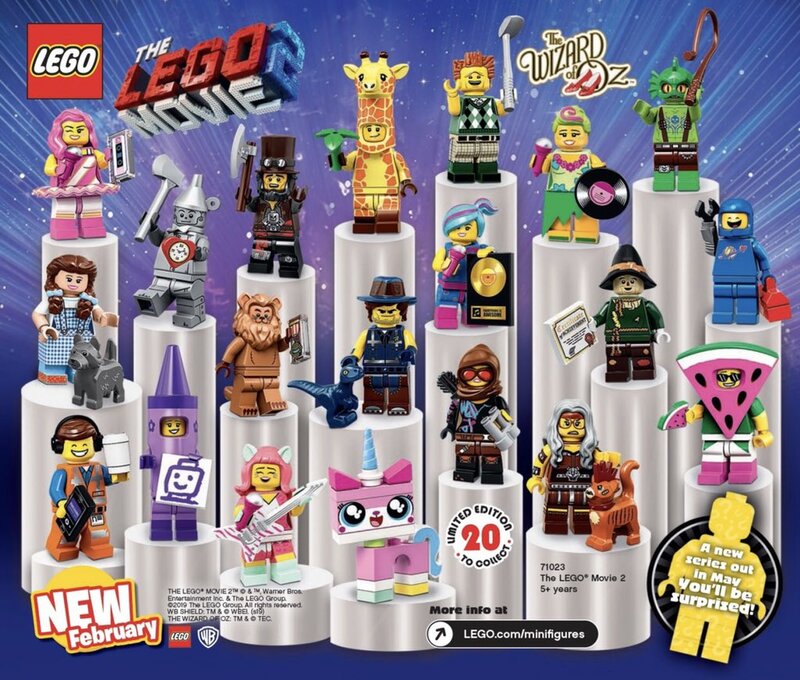 There is another Lucy minifigure included – her official name is apparently “Flashback Lucy”. This is apparently a Disco version of her before she became Wyldstyle, and she looks really great. I like her blue hairpiece, along with her magenta and blue outfit. She has dual-molded legs with side printing and comes with a pair of accessories – a mic and a record. Her mic is pink with a silver top. The other accessory is a printed 2×3 tile with a golden CD that is… Everything is Awesome. 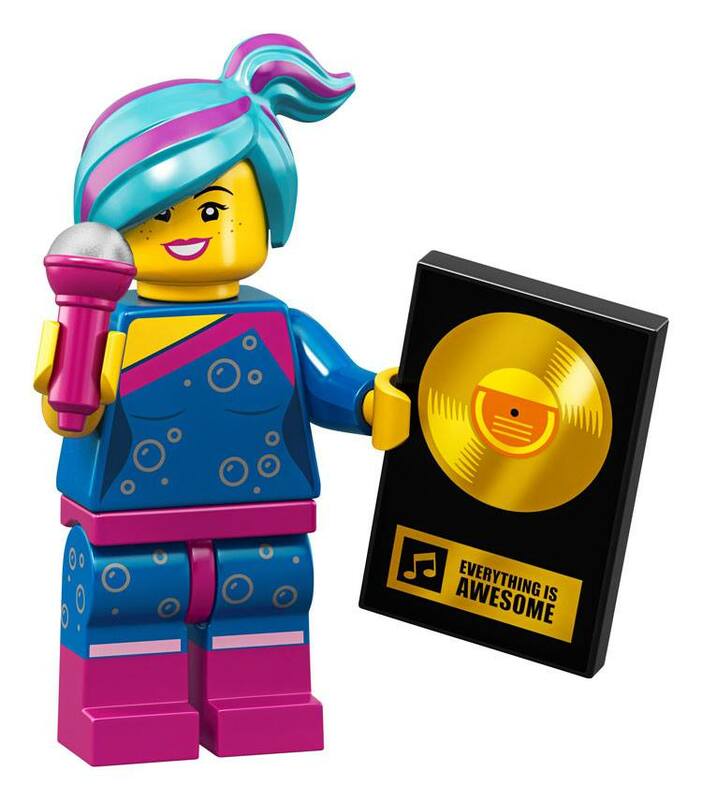 Some have pointed out that this could mean that Lucy was the one who wrote Everything is Awesome! 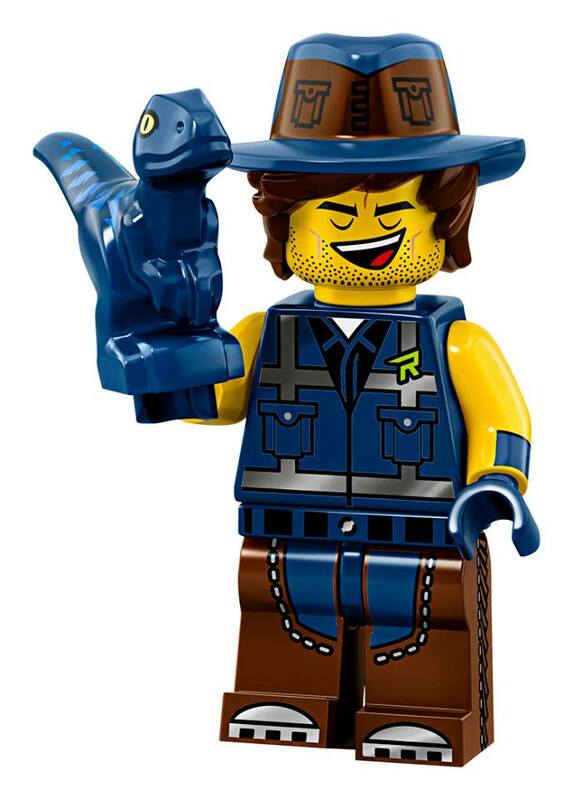 The next minifigure in the lineup is the cooler Chris Pratt character, Rex Dangervest. This exclusive variant of him has a dual-molded hat with hair combo that looks awesome. He has a closed-eyes expression with a smile, along with a dark blue and brown cowboy outfit. His accessory is dark blue baby dino, making for a great figure overall. 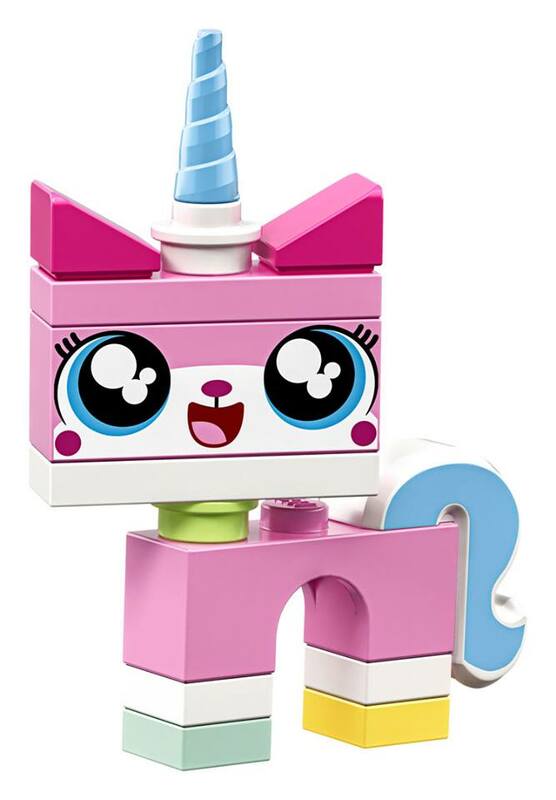 Next is the only brick-built character in the series who is responsible for the change in the minifigure bag design: Unikitty. Alison Brie’s happy character returns in the LEGO Movie 2, but this version of her looks relatively unchanged from the first LEGO Movie. She has a smiling expression and printed tail, and oddly enough uses the older, wobblier neck attachment style instead of the sturdier new design introduced in 2018. Next we get to everyone’s favorite spaceman, Benny! It looks like the apocalypse has hit Benny hard, as he now has a missing arm! 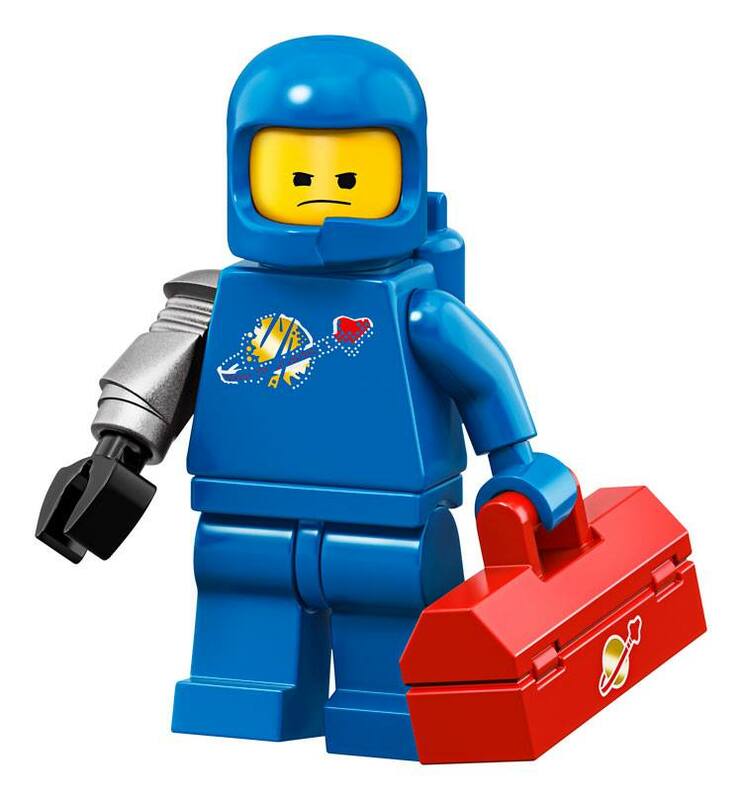 Benny wears his classic blue spaceman outfit with the “chipped” helmet, but he now has a cybernetic right arm. He has a double-sided face (angry and joyful) and a printed toolbox with the classic space logo, making for an awesome character overall. The President of Bricksburg and the CEO of Octan was oddly missing from most of the LEGO Movie 2 promotional material so far. However, it seems that he will appear in the movie based on this new figure. President Business has his classic squarish hairpiece along with a smiling expression, and wears a golfing outfit. He is very detailed, with a green printed sweater, dual-molded arms, along with dual-molded legs with front and side printing. He comes with a new golf club accessory. 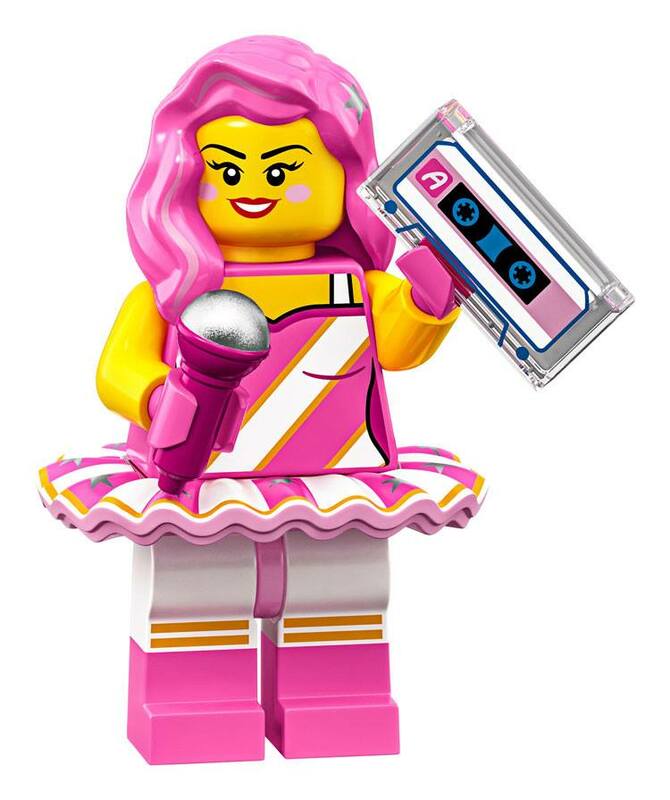 The next minifigure is this singer named Candy Wrapper. She wears a bright pink and white outfit that is clearly inspired by a candy wrapper, especially her printed tutu skirt! She looks really detailed overall and comes with a new mic and printed 1×2 cassette tape tile. I wonder if she is a character from the Systar system or if she is a member of Lucy’s old band. In this series, we are seeing multiple costumes such Giraffe Suit Guy, Watermelon Suit Guy and even the Cowardly Lion from the Wizard of Oz could fall into this category. That’s what makes Crayon Suit Girl unusual as her costume is not related to animals or food! This trend first originated in Series 17 with Rocket Boy and continued in series 18. It looks like this girl could be a resident in the Systar System. 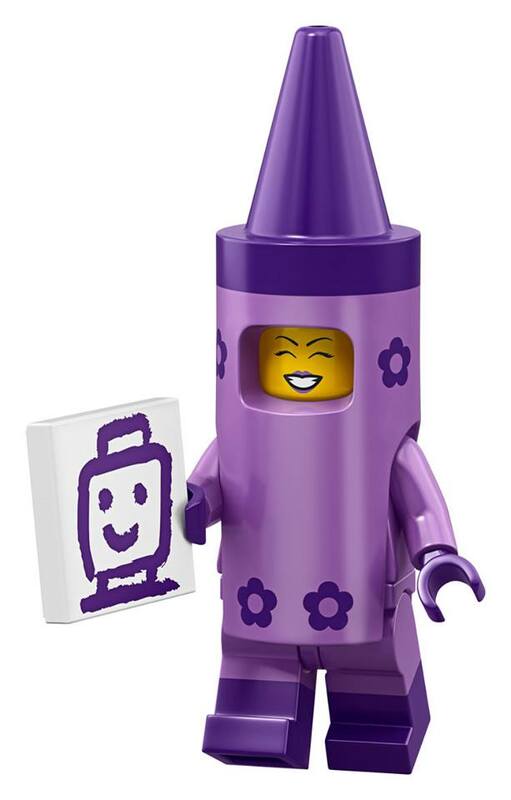 Her only accessory is a 2×2 tile with a purple drawing but she does have two face prints. Interestingly, she’s one of the figures packaged in two bags, with the ‘crayon’, instruction manual and baseplate sitting inside the blind bag while the rest of the pieces are in a smaller translucent bag. 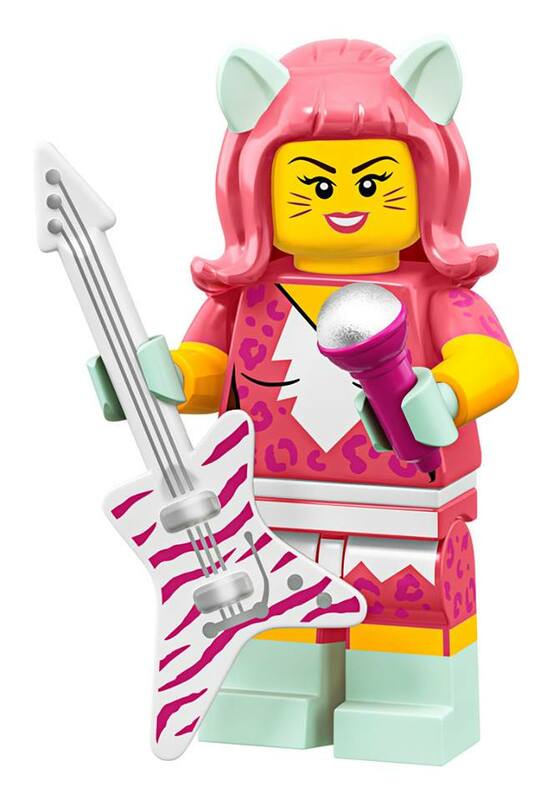 Here we have yet another singer minifigure. This female guitarist wears a cat-inspired outfit, with cat ears in her hair and leopard print on her torso and legs. She is pretty detailed, with dual-molded arms and legs, and has a white tail piece in between the torso and legs. She comes with a mic and a new printed electric guitar. 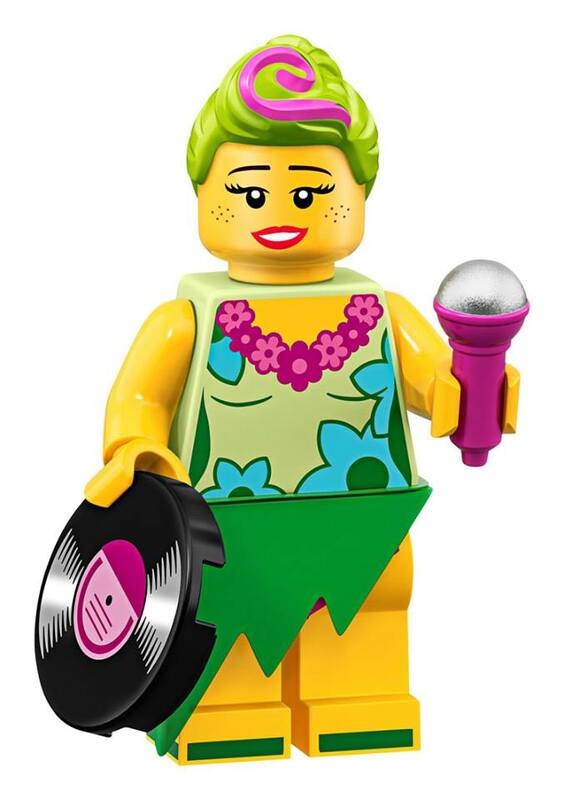 The final singer minifigure makes an appearance.This minifigure has an islander-inspired outfit, with a tropical color scheme and a grass skirt. She has light green hair, a new face print, a mic, and a printed 2×2 round tile for a CD. Costumed LEGO Collectable Minifigures are always fun and this guy is no exception. The Giraffe Suit Guy makes an appearance here and was spotted in one of the trailers! He has an awesome new mold for his headgear which features a giraffe head, complete with long neck. 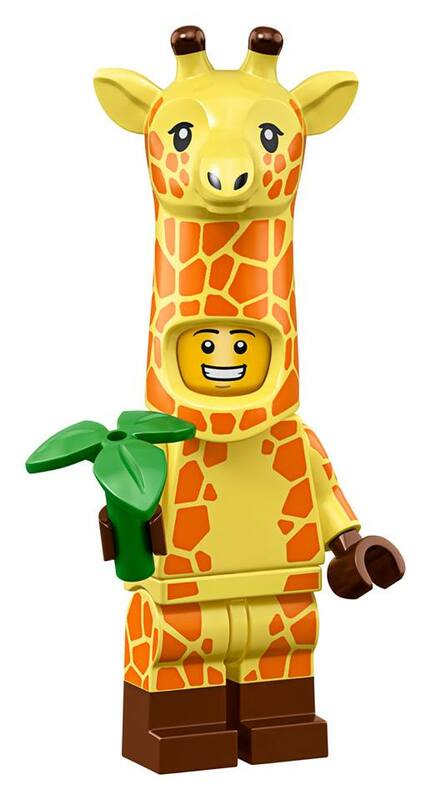 He has giraffe spot prints all over his body, and has dual-molded legs. His accessory is a plant, which feels a bit boring to me. 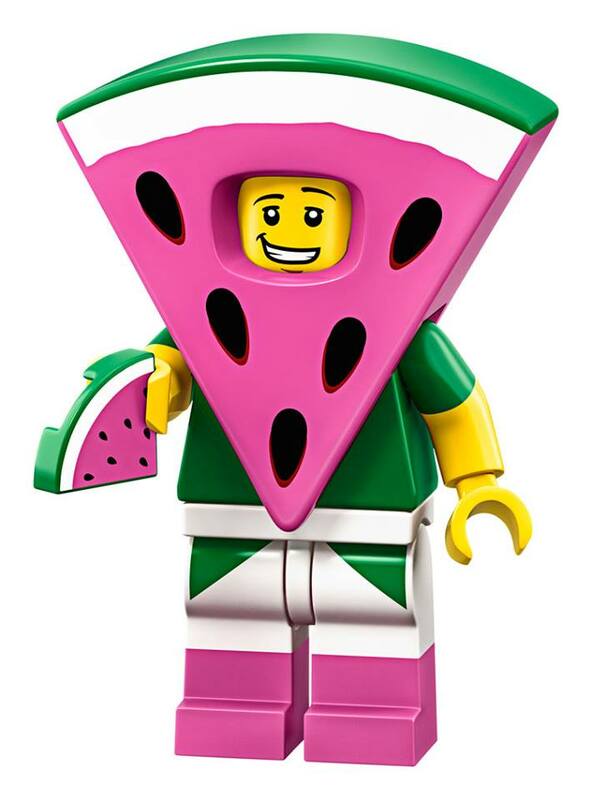 The final costumed character of the series is the Watermelon Suit Guy. This guy has a new headgear piece that is a giant watermelon slice, which looks great. He has a double-sided head: one side smiling, the other side with cool sunglasses. We now move on to the Apocalypseburg variants of the minifigures, the first of which is Abraham Lincoln. 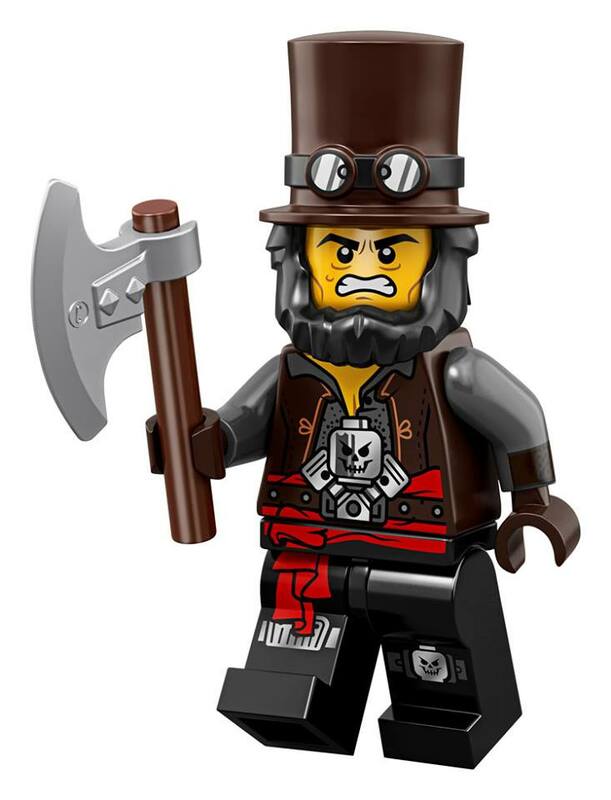 A regular Abraham Lincoln made an appearance in the first LEGO Movie and the first LEGO Movie Collectable Minifigure Series, and it’s nice to get him again. He has a new hat/beard piece that has molded goggles at the top, along with an angry face print. His outfit is grey, brown, and black, with skulls and a red cloth printed on. He comes with an axe. 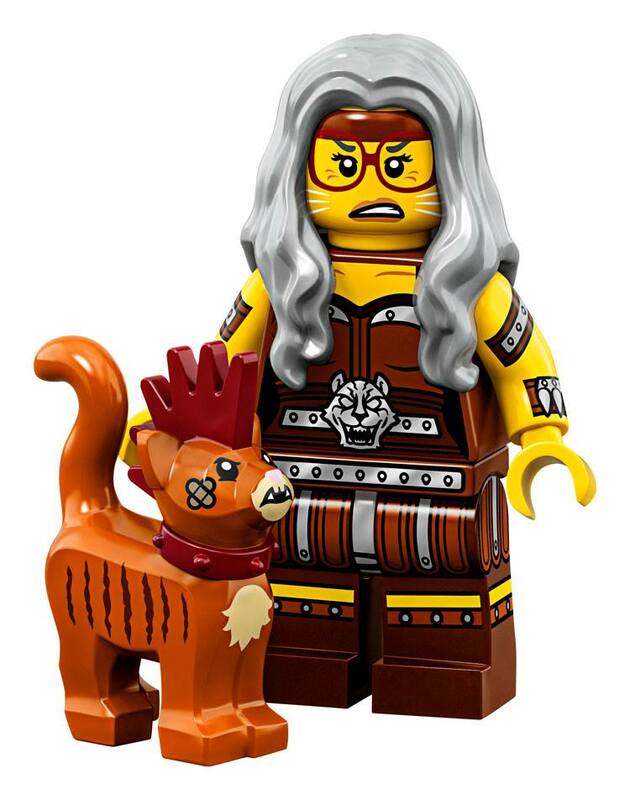 The next minifigure is an Apocalypseburg version of Mrs. Scratchen Post, the crazy cat lady in the first LEGO Movie. She had a short appearance in the first film and appeared in the first LEGO Movie Collectable Minifigures series so it’s nice to get her here. She has a similar face and hair design to her original figure, but instead of her regular clothes she wears a brown apocalypse-themed outfit with metal details. She also gets printed arms and side printing on the legs. Her cat is named Scarfield (a play on the word Garfield). This is actually a new mold for a cat, as despite being similar to the original cat mold, he now has a spiked collar and a brown mohawk. Scarfield also has a printed angry expression and a plaster on its cheek. 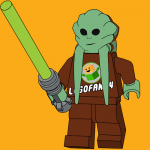 The final Apocalypseburg minifigure is the Swamp Creature. The Swamp Creature was one of the Master Builders in the first LEGO Movie and reappears here. He now wears short brown pants, a silver belt, and suspenders. He also gets a brown whip. 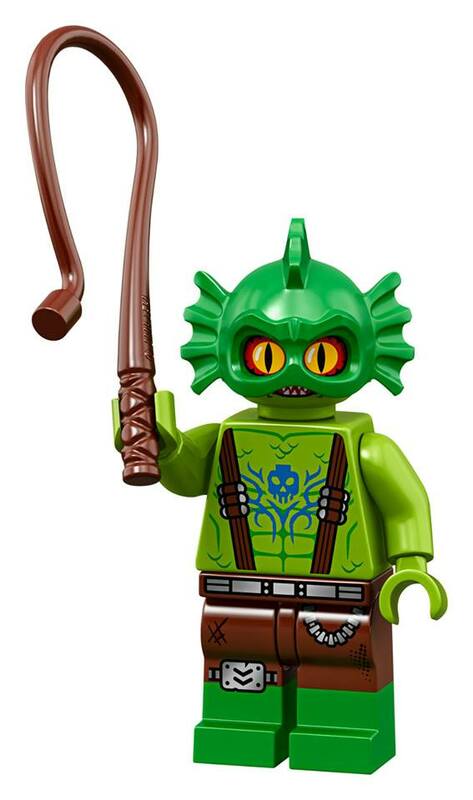 However, I think this is a fairly boring minifigure overall, especially considering he doesn’t look too different from the original Swamp Creature minifigure. The last four minifigures are actually a surprise appearance from the iconic Wizard of Oz movie. The Wicked Witch of the West and her Flying Monkeys appeared in the LEGO Batman Movie so it’s cool to see that the protagonists of the Wizard of Oz might appear in the LEGO Movie 2. As for Dorothy, I think this minifigure absolutely nails the likeness of the movie’s Dorothy. She has a new hairpiece that looks great, and she also has a double-sided head with a smile and scared expression. She has dual-molded arms to show her short white sleeves, and wears a checkered dress. The dress continues down onto a cloth skirt piece, and she has printed toes with a red design to represent her ruby slippers. 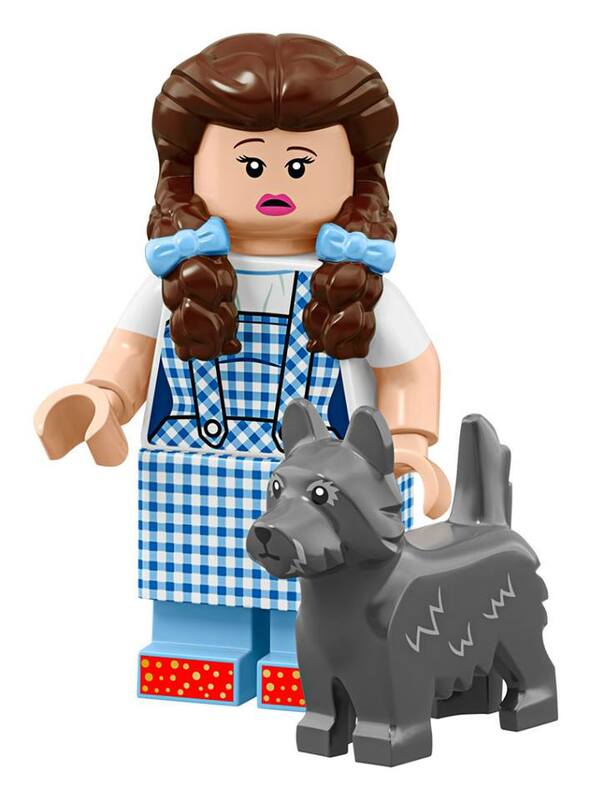 Dorothy also gets her dog Toto, a grey recolor of one of the existing LEGO dog molds. 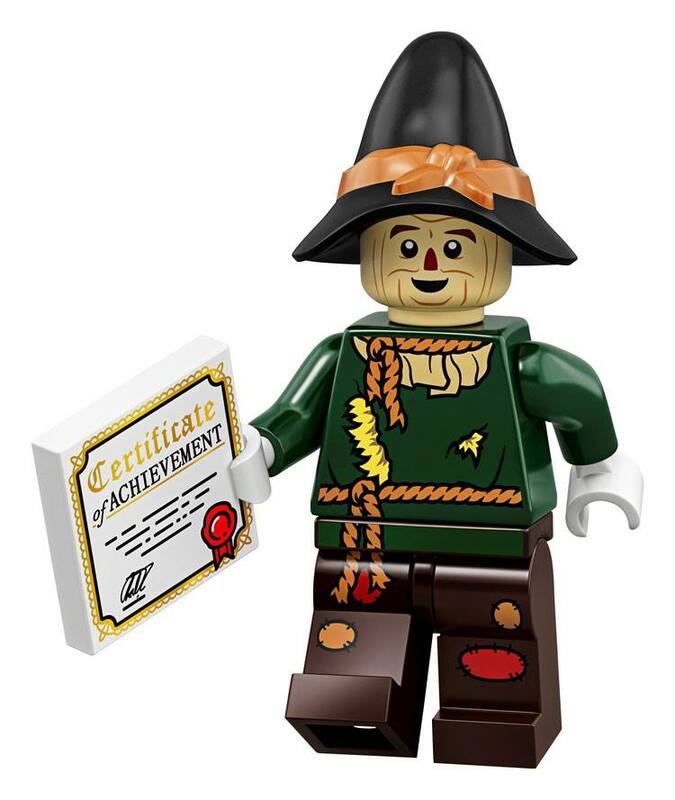 The second minifigure from the Wizard of Oz is the famous brainless Scarecrow. He gets a new black and nougat-colored hairpiece, which looks great and is accurate to the Scarecrow in the movie. He gets a printed tan face which is surprisingly accurate (at least in my opinion) to the Scarecrow’s face, complete with the joyful expression. He wears a dark green and brown outfit with some hay poking out in the torso print. His only accessory is a 2×2 printed tile with a Certificate of Achievement for his bran new brain. Next up is the Tin Man. This minifigure could potentially be almost fully silver in color, which is great. He gets a new hat accessory piece in silver, which could potentially be used as an accessory to oil him with. He has a smiling face print and a recolor of the bow tie neck attachment in silver. He has printing on his torso, arms, and legs (even on the sides) to show his metal panels. His accessories are his silver axe and a printed version of the new 1×1 heart piece to show his clock as a heart. 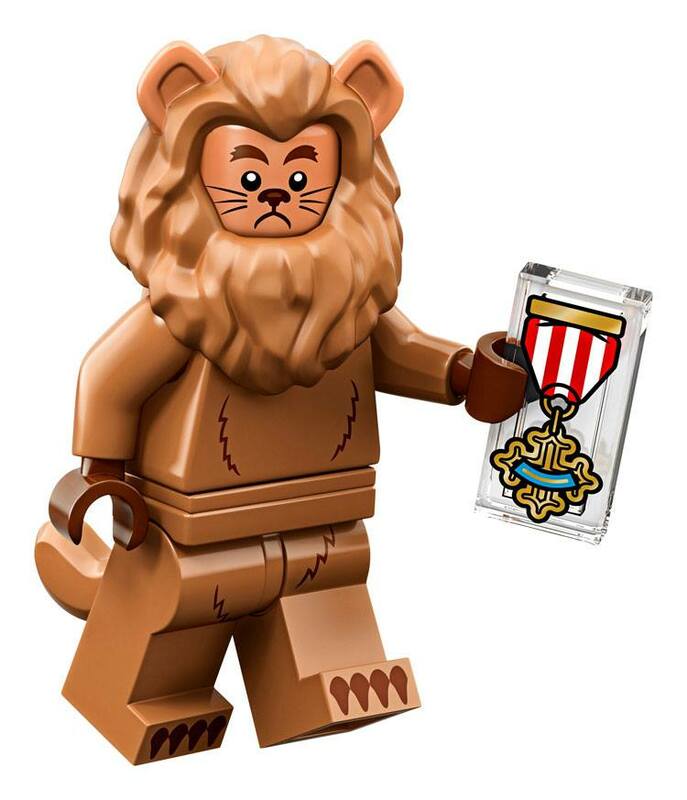 The final minifigure in the series is the Cowardly Lion. This character sports a nougat color scheme which is accurate to the character in the movie. He has a new head attachment to show his ears and his mane, and comes with a inquisitive, slightly confused face expression. He has simple torso printing on his torso and legs to show his fur and claws. He also gets a tail piece (attached at the waist) and a printed 1×2 tile to show his medallion of bravery. 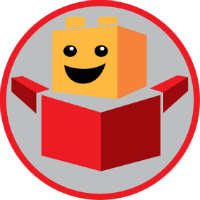 Everything will be awesome when the highly anticipated LEGO 71023 series releases January 31st. Rex Dangervest is also rumoured to be related to General Mayhem! With some awesome new molds, prints and a very Mad Max style, we’re sure fans can’t wait. Let us know what you think of the new series in the comments below. Loving the Mad Max theme? 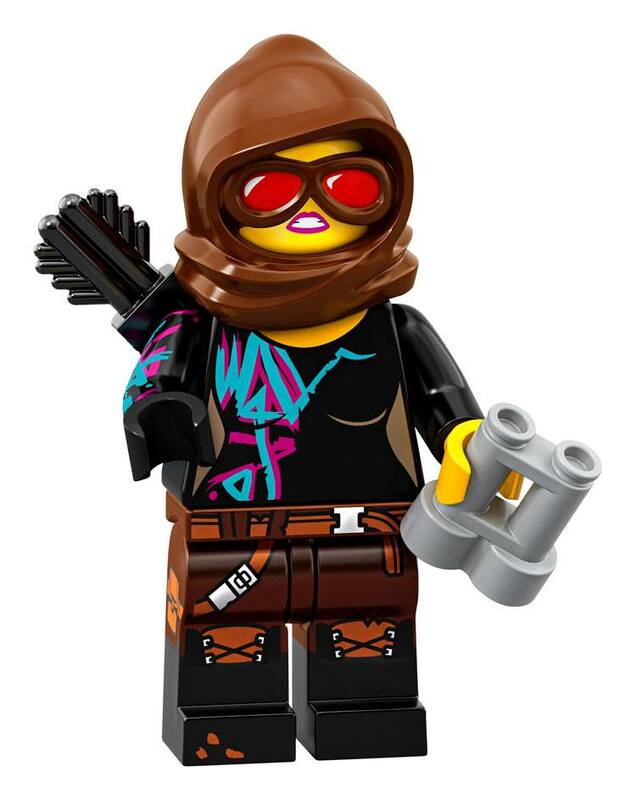 Who would you like to see in The LEGO Movie 2 Minifigures Series? See our full review of The LEGO Movie 2 Minifigures Series along with high quality photos of each character. Also check the LEGO 71023 CMF release date! Awesome, I can’t wait for this!!! But I have to. ? 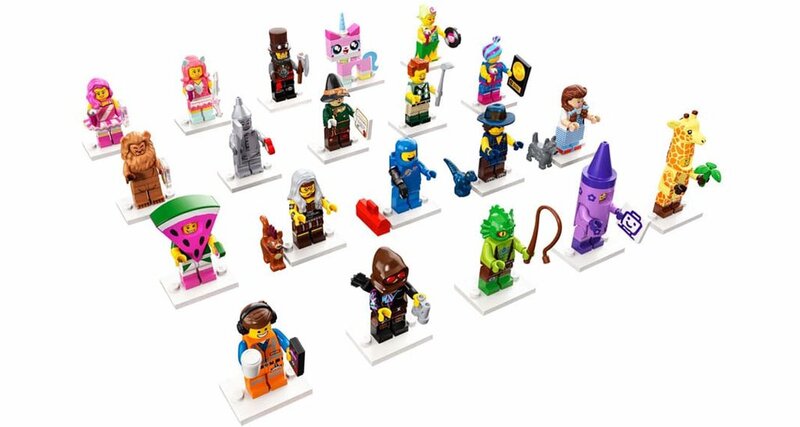 Oh my new Lego Movie 2 Minifigures, I can hardly wait! finally got mine today woot woot!